What’s your best defense against the Explosive Jack? The Explosive Jack can be quite dangerous at some times, especially when several of these lumberjacks show up at once. What’s your most common defense against them? Do you use animals with knock back power? Or do you send out a couple of Backattack Gator‘s to take care of them? Perhaps you take care of it yourself by using the Suspicious Brew to transform Koko to the real king of the jungle! 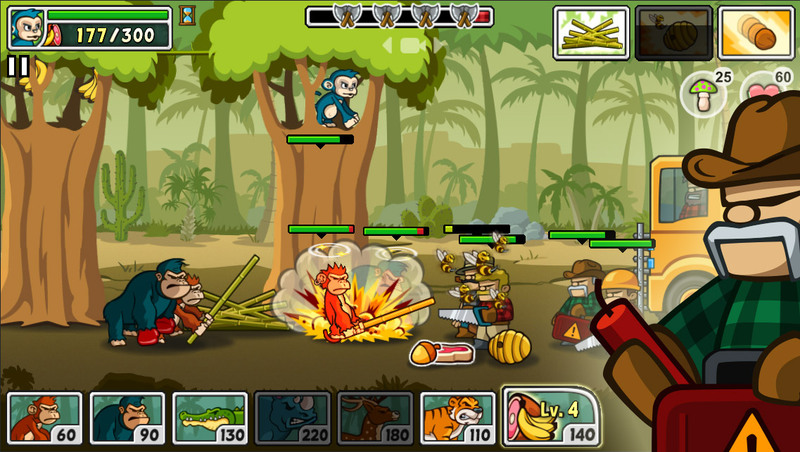 The Explosive Jack throwing some dynamite against the Almost Bright Ape who is wielding a Bamboo Stick. I hope everyone had a nice Christmas and a great New Year! – Added Leaf reward for replaying a completed level. – Made it easier to collect bananas. – Fixed an issue regarding the Backattack Gator. Download Lumberwhack: Defend the Wild on the iTunes App Store! Lumberwhack received another 9/10 star review, this time by Developer’s Accomplice. If you are a fan of the tower defence genre, then this is a must have game for those on the go. You will find yourself missing stops on a train trying to fight off the waves of enemies, and not care one bit. A high quality iOS game that ticks all the boxes for a tablet/mobile game. Who is your favorite animal? A few of the animals who help you defend the forest in the castle defense game Lumberwhack. Who is your favorite animal that you have rescued in Lumberwhack? Who has the best looks and who is the most effective lumberjack whacker according to you? Go ahead and share your opinion! iFanzine gave Lumberwhack 4.5 Stars! iFanzine Verdict: Many side-scrolling castle defense games of this type tend to be a repetitive bore, but happily, Lumberwhack: Defend the Wild makes for some fun action. The skills and upgrades are probably the best part of Lumberwhack. Tower defense fans should certainly give this a try. Read the full review at www.iFanzine.com. Touch Arcade gave Lumberwhack 4 stars! Lumberwhack is perfect for quick sessions, long playthroughs, or anything in-between. Although it’s incredibly simple in nature, it’s also one of the most fun castle defense games I’ve played in a while. I was recently approached by the alternative gaming website BeefJack.com for an interview regarding the release of Lumberwhack and to answer a few questions regarding mobile defense games in general. Speaking to BeefJack on his latest creation as a one-man studio, Clas Wineus addressed how a combination of genre-respective elements make Lumberwhack: Defend the Wild simple, clean and natural to play, in contrast to other games of a similar ilk. Read the full story at BeefJack.com. IGamesView played Lumberwhack and enjoyed it! IGamesView decided to try Lumberwhack out and record it at the same time. They shared with me that they enjoyed playing the game and perhaps their review team will have a look at it as well. You can view the full game play video on Youtube.